Garnet is not only a gemstone of great beauty, but also one with a fascinating history. It has been found in many cultures and dates as far back as pre-historic times. Different civilizations across time have created their own interpretations of garnet's mystical properties and lore. 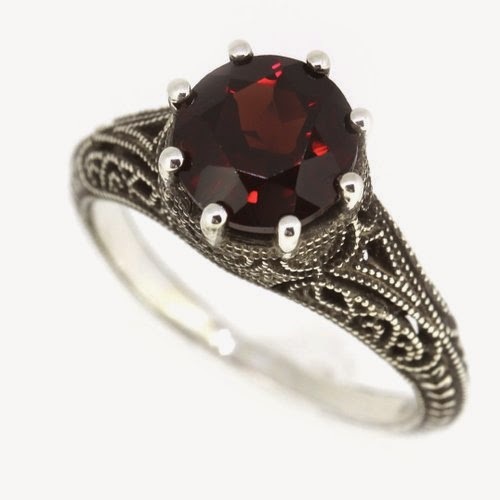 Ancient Greeks believed that a gift of garnet would ensure the return of a loved one or friend. The story begins with Hades, the dubious god of the underworld. Hades fell in love with Persephone, the beautiful daughter of Demeter (goddess of fertility). Angry that Hades had stolen her beautiful daughter into the underworld, the goddess pleaded with Zeus for Persephone's safe return. Zeus was sympathetic to Demeter's love for her daughter and sent a messenger to the underworld demanding that Hades return Persephone. Before Hades agreed, he gave Persephone a gift of pomegranate in hope of her return. Persephone and Demeter were reunited, but after tasting the sweet fruit, Persephone annually returned to Hades for three months of the year. Having a similar appearance to pomegranate seeds, ancient Greeks held that a gift of garnet would make a loved one return. Garnet is also rumored to be a part of the legendary story of Noah's Arc. It has been said that Noah used a lantern made of garnet to light the way through the darkness. The gemstone illuminated the night and safely steered the boat. Based on this legend, travelers believe that garnet is a protective gemstone that will help illuminate the right path. The deep-red gemstone also has been thought to have healing properties as well as intriguing lore. It is thought that garnet will heal its wearer of any blood or circulatory ailments. This healing power, in turn, helps quiet the unconscious mind and reduce sleep disorders such as snoring, sleepwalking, restlessness and sleep apnea. It may also allow the wearer to discover past lives while dreaming. Garnet is not only a beautiful deep-red gemstone to wear but a powerful mineral used for many of its physical and meta-physical properties. Try wearing jewelry with square-cut garnet stones to help aid in business opportunities and deter unwanted concern by others. Wearing a rectangular-cut garnet piece can promote intellect. If worn as earrings or pendants garnets can attract those born in the signs of Aquarius, Leo, Aries, Scorpio and Capricorn. Interestingly, garnet is widely accepted by many distant cultures as the birthstone for the month of January. It also makes a great gift idea for those celebrating their 2nd and 6th wedding anniversary. This passionate red stone is thought to rekindle an old flame, ignite an existing one, or help express feelings with greater ease.